Liver PRETEXT II; drawing shows five livers. Dotted lines divide each liver into four vertical sections that are about the same size. 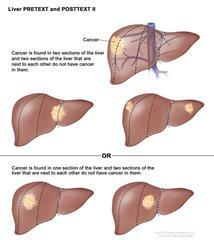 In the first liver, cancer is shown in the two sections on the left. In the second liver, cancer is shown in the two sections on the right. In the third liver, cancer is shown in the far left and far right sections. In the fourth liver, cancer is shown in the second section from the left. In the fifth liver, cancer is shown in the second section from the right.